I can’t believe Easter is merely a few weeks away – my favourite celebration of the year and time to relax with family, friends and good food with the onset of spring just around the corner. I’ve spent a couple of Easters on the Greek island of Ithaca and their national customs and local traditions do differ slightly from ours! 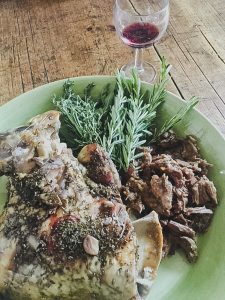 The aromas of garlic and fresh rosemary and oregano wafting through geranium-filled villages as family members turn the lamb on the spit is a true reflection of how the Greeks celebrate this religious feast and is still enjoyed by many Greeks all over the world. 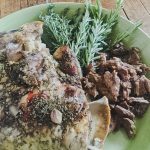 My recipe for Greek lamb calls for shoulder, which is tougher and fattier than leg and entails long slow cooking for melt-in-the mouth results. Consequently, you can relax and spend time helping the children with their Easter egg hunt while lunch cooks in the background – oh, and it’s cheaper than leg too! If you have time to marinade the shoulder beforehand, so much the better but it isn’t vital. Peel and crush the garlic in a pestle & mortar with the sea salt. Mix the marinade ingredients together, stab the lamb all over and spread this herby mix, pushing it deep into the holes. Cover well and marinade overnight if you have the time. Take the lamb out of the fridge at least an hour before it goes into the oven so that it can come back to room temperature. I tend to wrap the lamb in a large but well sealed foil parcel, adding a large glass of red wine to the parcel before putting into a preheated oven. Start the cooking at 220C/200C fan for about half an hour, then reduce the temperature to 160C/140C fan and continue cooking for about 4 ½ hours until the meat falls off the bone. Par-boil the quartered potatoes in salted water for about 8/10 minutes and add to a roasting tin along with the whole garlic bulb, tossing it all well in olive oil. Put into the same oven as the lamb about an hour before you want to eat. At this point you can unwrap the lamb and increase the temperature back up to 200C/180C Fan and continue to cook the lamb for another 30 minutes. Remove the lamb and cover loosely to allow it to rest and continue cooking the potatoes until they are a pale golden brown all over. Use the cooking juices from the lamb to make a simple gravy by pouring off all most of the fat, add a little flour and stir to thicken, then add a generous splosh of red wine and a good tablespoon or two of redcurrant jelly – simmer gently with a little seasoning while the potatoes finish cooking and serve with a Greek salad for an authentic Easter lunch! 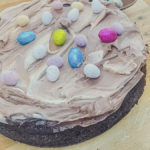 Easter wouldn’t be Easter without a generous helping of chocolate, so here is a fool-proof recipe for an indulgent treat, either for pudding or for serving up at teatime if you’ve got family and friends coming over. Decorate with mini eggs or you could even use Creme Eggs cut in half sunny side up for an extra Easter hit! 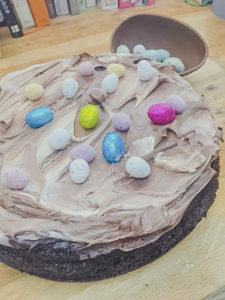 It’s a great baking project to get the kids off their screens over the holidays, maybe they could use up any leftover Easter eggs for the decorations – that’s if they have any! Put all the ingredients into a mixing bowl (apart from the boiling water) and beat well. When it is all blended well together, slowly add the boiling water and slowly beat the mixture together until you have a very loose batter. Divide this between the two tins and bake for approximately 25-30 minutes until a skewer comes out clean. Leave in the tins for about 10 minutes and then turn out on to a wire rack to cool. Make a simple chocolate ganache to cover the cake. Heat the double cream to the point just before simmering. Break the dark chocolate into small pieces so that it melts faster and easier. Put the chocolate in a heatproof mixing bowl and pour the hot cream over the chocolate. Stir well to dissolve the chocolate and leave to cool for about 30 minutes. Pour over the cake and decorate how you like! I like to sandwich the two halves together with whipped cream to which I add a tsp of vanilla paste and a good handful or two of fresh raspberries. NOTE: This cake should be kept in the fridge if it doesn’t immediately disappear in front of your guests - keep for no longer than 3 or 4 days. 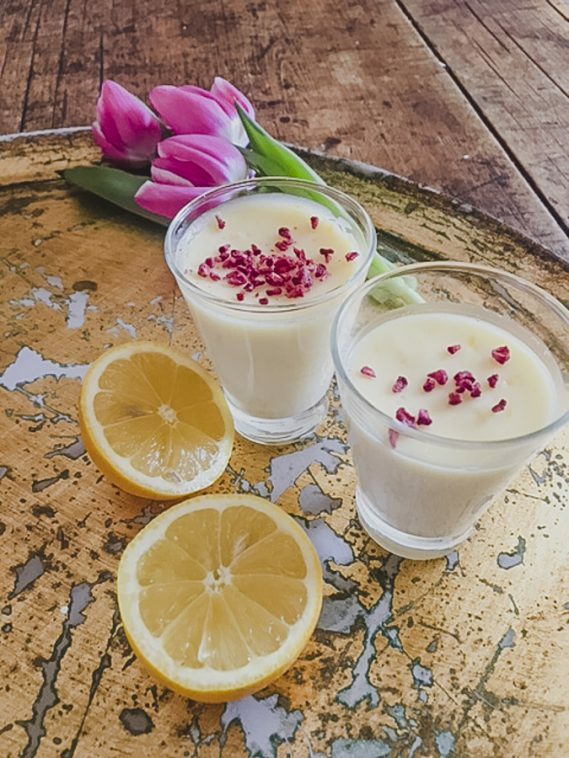 For a lighter dessert, another easy pudding is lemon posset which is always a roaring success and would go well after the lamb. A classic dessert that's super easy to make and perfect after a rich lamb roast! Bring the double cream and caster sugar to boiling point and boil for 3 minutes. Use a big pan and do not take your eyes off this boiling mixture as it only takes a few second to boil over, resulting in one sticky mess! When it has boiled gently for 3 minutes, remove from the heat and add the zest and juice of 2 large lemons. The mixture will thicken upon stirring. Pour this into individual ramekins or shot glasses and serve with homemade shortbread.